Located in Seminyak while on vacation in Bali, would require lodging for overnight and rest, or as a temporary home to put luggage. 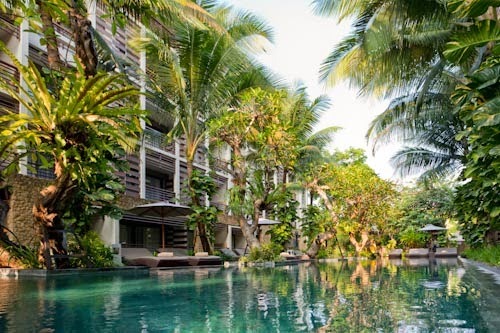 One of the leading hotels in Seminyak is The Haven. The hotel is located at Jl. Raya Seminyak 500 - Bali. 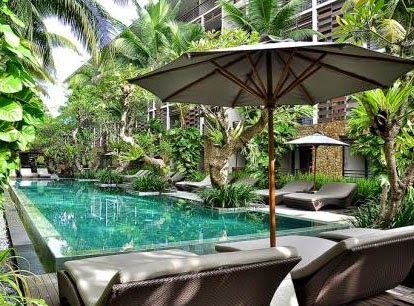 The Haven Seminyak Bali is quite large. Hotel with five floors, has a swimming pool, spacious rooms with a living room. Swimming pool surrounded by frangipani plants. If swimming in this pool was located on a lake. Offering food that is both healthy and delicious, SABEEN sources the finest seasonal and organic ingredients alongside choice imports to bring you sublime salads, pan-Asian classics and elaborations on international favourites. SABEEN also offers rebalancing smoothies, power potions and rejuvenating juices, tea, coffee and a wide selection of wines and spirits. Sabeen Restaurant is offering fabulous experience with tremendous menu ideas for spending your Friday evening. We invite you to celebrate your Friday with rich recipes from our Chef from appetizers, salads, hot dishes, to variety of dishes. Abundant selection from marinated sirloin, tenderloin, pork ribs, beef ribs, BBQ spareribs, salmon, lamb, sausages, skewers, chicken to seafood with many selection of sauves. Featuring live band, only for Rp. 238.000++ per person. 1.Happy Hour Havener’s Cocktail. Everyday 5am – 7 pm. Only IDR 73.000++ /drink, choose your favorite cocktail: Little piece of haven, Bar mule, Acapulco, Sabeen exotic, happy Haven, coco martini, tol ben tol, aussie flag, bali bellini, purple island, melon ball, apple martini, gin daisy, dirty old fashion, tropical tini. Do not worry if you are bringing your toddlers to eat at Sabeen Restaurant, we have kids menu cater special for you. Menus are spiderman sausages, chicken run, pasta with meatballs, nemo, and asian combo, all served with French fries or mash photos, softdrinks or juice, and a scoop of ice cream. Only at IDR 65.000++/portion. We believe your kids will enjoy those meals. A true reflection of the Naturally Elegant. Our certified therapist are excellent in bringing a gently soothe and lull you into sense of inner plenitude. Stimulating your mind at Atma Spa. The best way to energize your body and revitalizes your deep inside desire. We want to give a pampering treatment for our guests who have a birthday this month. Come to our Atma Spa and proof it with your valid ID card. We will give you 50% discount for your favorite treatment, because we want to make sure you have a soothing and relaxing day on your birthday. Enjoy 30% discount everyday from 6 – 10 pm for any treatment of 60 or 90 minutes treatment. The 30% discount is also applicable for all couple treatment. We invite you to get facial, body treatment, or even our signature treatment during your stay at The Haven to relax your muscle after a full day of activity. This happy hour is also perfect for those who just arrived at our hotel from a long flight or road trip. Scalp massage and a energizing foot massage are performed during ABW treatment and you will emerge feeling refreshed .The power of Aloe and fresh cucumber with banana leaf wrap are used to cool , soothe your skin after sun exposure.